Holiday Round Up! Everything you need to celebrate the Holidays! It’s finally that time of year again! Crackling fires, the smell of pine trees and baked goods wafting around your home, and the comfort of those you love surrounding you. Christmas has arrived! Here you’ll find a compilation of decoration ideas all the way to safety tips you’ll need this holiday season! A highly cherished part of the holidays is making your home look like a winter wonderland that’s full of holiday cheer. One of the worst parts is not having all the decorations that you dreamed of. If your holiday décor needs some sprucing up or if you just want more options (and who doesn’t? ), we have just the thing to help you out. From rustic to elegant to modern, there’s something for everyone to enjoy! Our listing Coordinator Leigha’s personal favorite tip for the holidays is to buy tons of garland, real or fake. She loves garland because it’s so versatile. You can put it over a fireplace mantel, down stair railings, use it as a centerpiece for your table, hang it over door frames, wrap it around deck railing, add lights to it, add ribbon to it, etc. Plus if it’s the real stuff, it makes your house smell (and look) like a winter wonderland. It’s also inexpensive! She gets 50 feet every year from a local woman for just $15! Save yourself some money this holiday season with adorable DIY ornaments, perfect for all ages! It’s a wonderful way to spend some extra time with those you love and customize your Christmas tree however you like. Let your creativity shine this holiday season and try out these DIY ornaments from Country Living. With 60 options, we’re sure you’ll find something you love! Melissa will be creating the paw print ornaments with her pups! There’s nothing like waking up on Christmas morning to a fresh batch of your favorite holiday cookies! The delicious smell, mouthwatering taste, and the joy they bring once you’ve had one is unmatched. 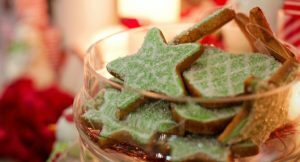 From local Hardin Park School Counselor, these Eggnog Frosted Gingerbread Cookies are so good you’ll want to make them all year long! Give the recipe a try this season! Taste testers Shalamar and Sara give these their stamp of approval and know you won’t be disappointed. One of the best parts of the holidays is going out and cutting down your favorite tree to decorate. With all the joy and holiday cheer going around it can be difficult to remember that disaster can still strike at any moment. Although fires started by Christmas trees and decorations are not as common, they are more likely to be serious as there are more flammable materials than normal present. Keep your loved ones and home safe this year by following these tips form the National Fire Protection Agency!